You will be sharing the narrow roads with lots of traffic - trucks, buses, jeeps, minibuses, cars, scooters, pushbikes, soup carts, pedestrians, horses, dogs, pigs, goats, ducks and chickens. There are almost 300 Million Indonesians crammed into only 1.8 Million square Kilometres, a relatively small area a bit smaller than Mexico, or Victoria and Queensland. The traffic buzzes along with everyone overtaking constantly, often 2 or 3 abreast with horns blaring. Motorbikes with a family of 5 on board will zoom in from side streets and blind alleys without even glancing up, completely oblivious of the dangerous oncoming traffic who are just expected to give way to anything in front. This seems to be the only “rule”. It’s not very relaxing to be driving amidst all this chaos, but just remember to keep one foot hard down on the accelerator, the other ready on the brake, and your hand on the horn. Drive defensively. Constantly check your rearview mirror for overtaking trucks. Sound your horn whenever you approach any vehicle or person to let them know you are there. This is considered polite behaviour in Indonesia. In fact it is positively dangerous not to sound your horn. Remember to drive on the LEFT side of the road, and beware of locals who regularly go the wrong way down “one-way” streets - look both ways before entering any street. The same goes for when you’re out walking. Expect the unexpected. Hazard lights flashing seems to mean “I’m coming through no matter what”. Red traffic lights are often ignored. Motorbikes should expect no respect from approaching cars who will overtake even if it means forcing you off the road into a ditch. Expect this to happen to you every day. For many reasons, it is much safer to hire a car with a driver included. Often it is only $5 or $10 extra for the driver, and you will be free to relax and enjoy the view while the driver’s local knowledge gets you to the surf with a minimum of stress. The driver will know cheap cafes where the locals eat, all the shortcuts, and maybe even introduce you to his family. He can guard your belongings while you enjoy a long relaxing surf session, and you can enjoy a cold beer in the back seat on the drive home. 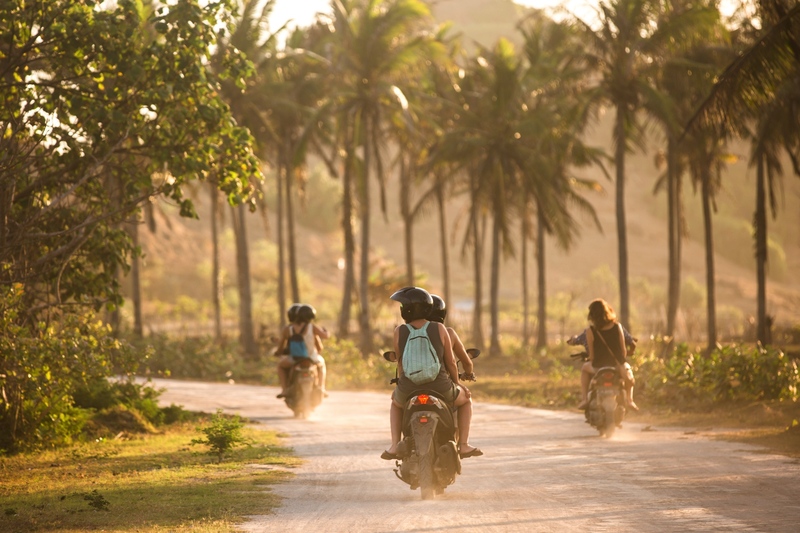 If you still plan to rent a motorbike, bring a full-face crash helmet from home. Although you get a rental helmet included, they are often thin plastic construction-site helmets, with no face protection. Gath surf helmets are much safer than most Indonesian helmets, and look pretty cool in or out of the water. Taxis are a cheap and convenient way to get around Kuta for only $2 to $5 each trip. Taxi drivers might suggest a set price for your trip, but it’s always cheaper to tell them to turn on the meter. They may say it is broken, or hide it with a rag. If they refuse to turn on the meter just get out. Be careful of taxis who offer you women, gambling or drugs - all are illegal. It could be a scam to rob you. Just smile and say “no thanks”. International Driver’s Licence, even for scooters. Get it before leaving home, or a 30 day local one. Rental Vehicle & Liability Insurance.